Presiding Officer/ Polling Officer training Module. Home » Election » Presiding Officer/ Polling Officer training Module. Pramukh matdan adhikari, pratham matdan adhikari, Matdan Adhikari ni talim mate upyogi module. 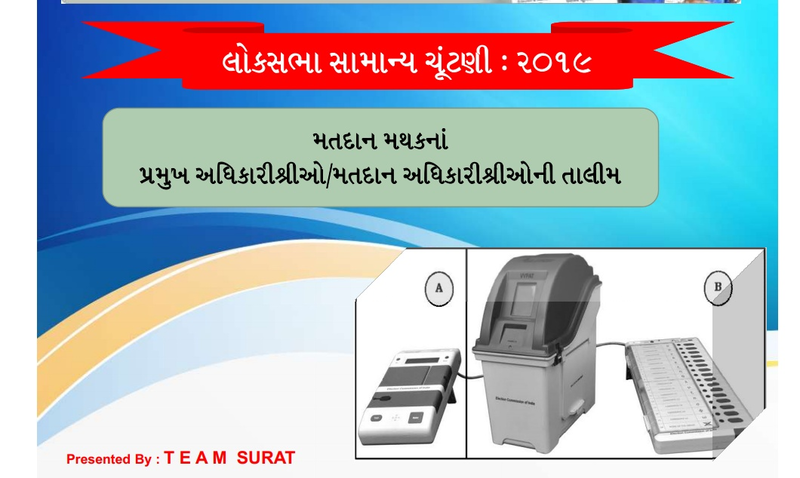 Useful election material for Loksabha Election 2019. Read carefully all 81 Pages for election duty of all election staff. Training Schedule. • Schedule of State Level Refresher Training for Nodal Officers of various District Level Cells · • Two(2) Days State Level Refresher . Training Program for Lok Sabha General Election 2019. ... for Lok Sabha General Election 2019. Officer & Employe Training Programme For Loksabha Election 2019. ItsI very Nice and Useful Information sharing by him.